The gift was amazing and everybody loved all the varieties. The delivery was right on time and the quality of the Pecans were extraordinary. Excellent customer service and have already shared the details to my friends. Ordered this for a business Christmas present. Easy, prompt, & quality product & service. As a native Texan, I always try to send gifts to family and friends out of state with the tastes of our great state. Since the state tree of Texas is the Pecan tree, these tins NEVER disappoint. This gift received rave reviews. Thanks! Both of my gift recipients have been pleased with this item, and both deliveries have been prompt. A gift from Texas is even sweeter. I should do my wife and myself a favor and order a tin for us! I sent the tin to a friend in Ohio who once lived in TX. She reported that everything was delicious. We sent this gift to a friend out of state. We wanted a Texas product and he said the nuts were delicious! I cannot provide a personal review of these items because I had them sent to my sister in Missouri. I can tell you she very much appreciated them. 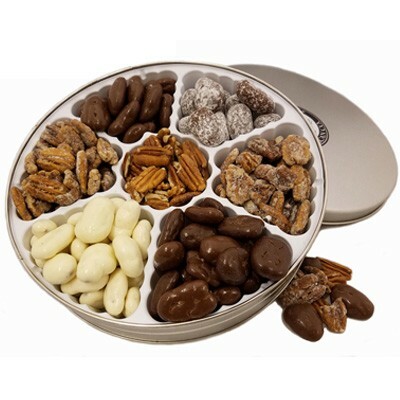 The tin of pecans were very good as well and the variety was unexpected. The original order had an error in shipment and my sister received a pecan pie instead of the Seventh Heaven gift tin. This error was corrected and she did receive the tin of pecans. However, my nephew would like to pass on to you the pecan pie was very good. I will definitely use your service in the future for my friends' and family's gifts to show them a taste of Texas.